Without a WD system, the tow vehicle's rear axle load could significantly increase due to leveraging of the tongue weight. Conversely the front axle load will be decreased. These axle load changes will make most tow vehicles unlevel. The decreased load on the front axle can cause a loss of steering control and braking difficulties. The increased rear axle load might exceed that axle's rating, and the load on the receiver might exceed its rating. A weight distribution system enables a tow vehicle to more effectively handle the tongue weight of a trailer by removing some of the load from the tow vehicle's rear axle and distributing it to the tow vehicle's front axle and the trailer's axle(s). Note - When the WD system is engaged the actual tongue weight does not change. Recommended tongue weight is from 10% to 15%. Consult your owner’s manual to determine if your vehicle is suited for a WD system. Several recent posts have discussed WD hitches. One member stopped using his because he felt it was contributing to sway by decreasing the "tongue weight". I hope the following will give a better idea of what the WD hitch does and does not. Questions and comments are welcome. Spring bar tensioner pulls UP on rear end of bar and DOWN on TT tongue. DOWN force of 2000 lbs on TT tongue adds a load of 300 lbs at TT axles. This is calculated using ball coupler as the fulcrum: 2000x30/200 = 300. Now, having added a load of 300 lbs at the TT axles, we must balance the TV/TT teeter totter. Using the TV’s rear axle as the fulcrum, to balance the 300 lbs at the TT’s axles we must add some load at the TV’s front axle. The lever arm from the rear axle to front axle is 130”. The lever arm from the rear axle to the TT axles is 65+200 = 265”. The required balancing load at the front axle is 300x265/130 = 611.54 lbs. Or, we can calculate the reaction at the TV’s rear axle by treating the TV/TT as a lever with the fulcrum at the TV’s front axle. The lever arm for the 300 lbs at the TT’s axles is 130+65+200 = 395”. The lever arm for the rear axle is the wheelbase = 130”. Since the TT axles are “lifting up” with a force of 300 lbs, this translates to an “uplift” at the rear axle equal to 300*395/130 = 911.54 lbs. Now it is interesting to consider what happens at the hitch. DOWN force of 2000 lbs on TT tongue adds a load of 1700 lbs at ball coupler. This is calculated using TT axles as the fulcrum: 2000x170/200 = 1700. The UP force of 2000 lbs on the rear ends of the spring bars produces an UP force of 2000 lbs at the hitch end of the spring bars. The UP force of 2000 lbs minus the DOWN force of 1700 lbs on the ball gives a net UP force of 300 lbs at the hitch. The vertical load on the receiver has been reduced by 300 lbs. The vertical load transmitted through the ball has been increased by 1700 lbs. It is interesting to note that TT weight and “tongue weight” do not enter into these calculations. The WD hitch does not distribute “tongue weight”. It simply removes load from the TV’s rear axle and distributes it to the TV’s front axle and the TT’s axles. The excess weight the WD hitch is distributing is part of the tongue weight plus added weight in the back of the truck. It certainly doesn't reduce the tongue weight. In any case, tongue weight per se isn't what we seek. The tongue weight as a proportion of the total trailer weight is just an analog for the distance the longitudinal center of gravity (LCG) is forward of the pivot point (wheels). The farther forward we get the LCG the more stable the trailer is, other things remaining equal. Ron and I hitch up his trailer. The rear of the truck sits way low, the front is way high, and the front wheels don't steer or brake worth a darn 'cuz of this. We stick a long pry bar into the back end of his truck frame and pull up hard. The rear rises and the front drops. I have Ron trot along holding that bar up as I drive...the truck drives really well now, but Ron is getting tired. He chains the bar to the trailer tongue so he can take a breather. This works OK on the straights, but is a big problem on curves. We figure out a pivot system for the point the bar attaches to the truck. It turns well, but is really bumpy. Ron's Mrs. says to use spring steel bars. Duh!...Why didn't we think of that? Ron and I, and his Mrs., just invented the weight distributing hitch. Kenn, Boy that sounds like a great invention - did you consider getting a patent on that?? Ron, Thanks for that drawing and explanation. I have one question and one hypothetical. 1. Is that your drawing and figures or did you find that somewhere? 2. Can I give you a hypothetical and ask you to fill in the blanks? Lets say you have a TT and it weighs 5000#'s. Let say that with the manufacturer's axle placement the tongue weight is 650#'s. OK you put that on the hitch ball of a weak truck, and the trucks rear drops alot. Now you add a weight distribution hitch. Lets say the WD hitch weighs 150#'s. What happens to that now 800#'s(roughly) of weight on the ball???? Are you saying it remains the same, or does some of that 800#'s of weight get transferred to the front axle of TV and TT axles?? If it gets transferred what are the %'s of the transfer? PS - I know that you are not actually reducing the TT's tongue weight, but are you not distributing the weight off the TV's ball thereby having less weight on the ball?? Is that your drawing and figures or did you find that somewhere? The drawing was produced on my home PC using AutoCAD LT. The figures (numerical examples) are hypothetical values assumed to be representative of a Suburban towing a 30' trailer. First, there is only 650# on the ball. The weight of the WD hitch is carried on the receiver, but not on the ball. Prior to tensioning the WD bars, all of the 800# total is "hitch load" and is transferred via the receiver to the TV's axles. After the WD bars are tensioned, the 650# tongue weight does not change. Neither does the 150# hitch weight. However, the WD tensioners create an additional 1700# (using my example values) DOWN force on the ball and an additional 2000# UP force on the hitch head. The net result is a decrease of 300# in the hitch load. But, the real reason for the increased load on the TV's front axle and the decreased load on the TV's rear axle is due to the additional UP force of 300# exerted by the TT's axles. No, the load on the BALL actually INCREASES by the assumed 1700#. The load on the receiver DECREASES by 300# as explained above. BTW, for my explanation of the difference between "tongue weight" and "hitch load", see Tongue Weight and Hitch Load --- What are they and how are they different? After the WD bars are tensioned, the 650# tongue weight does not change. Neither does the 150# hitch weight. OK, lets say I have a thin tongue weight scale capable of reading 1000#'s. Next, I put the scale between the TV ball and tongue and it reads 650#'s, as my TV's rear end sags. Then I hook up my WD hitch thereby distributing weight to the TV front axle and TT axles. This is wonderful because now my TV is level again. Here is the big one - you are saying that the scale will STILL read 650#s - is that right?? Nope. I am saying that your scale will read 650+1700 = 2350#. Where does the 1700# come from? I assumed the WD tensioner pulls DOWN on the TT tongue with a force of 2000#. Since this force is applied 30" behind the ball and since the TT axles are 200" behind the ball, the force is distributed 300# to the axles and 1700# to the ball coupler. The total 650# "tongue weight" plus the 1700# tensioner force is transmitted through the ball to the hitch head. The front end of the WD bars are pushing UP with a force of 2000#. So, the hitch load now is 650# DOWN plus 1700# DOWN minus 2000# UP = 350# DOWN. Your scale is not measuring ONLY the original 650#. It is measuring the original 650# PLUS the additional load imposed by the WD bars. At the risk of getting into a semantics debate, my position is that the load on the ball does not necessarily define tongue weight. 1. "Gotta try to straighten out some minor errors here. Firstly, your tongue weight will not be all on the tow vehicle as previous posts indicated. When properly connected, the WD hitch will spread out the tongue weight so that 1/3 is on the front wheels, 1/3 on the back wheels and 1/3 on the TT. In the real world, it never works out so perfectly, but the point is that if you had a 900 lb. tongue weight, all 900 lbs. is not going to be on the tow vehicle when hitched." 2. "While at this, need to point out that there are many who are "close", but really miss enough to be dangerous to the newbies or those still on the learning curve (think one's giving the mis-info are ditto...they too are still on the learning curve). Your 1/3-1/3-1/3 weight distribution is smack on and is what is missed or not understood. 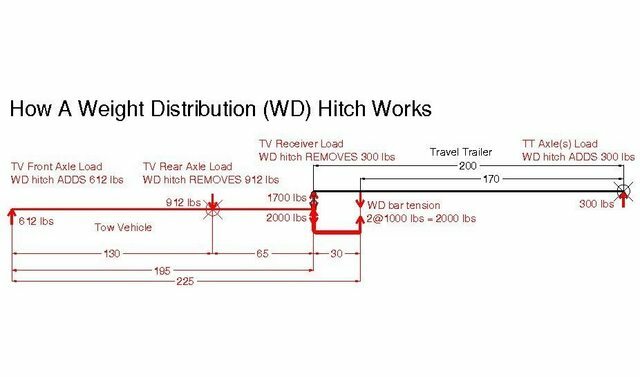 This ratio is arguable as to the numbers, but there is a ratio of weight distributed between the three (TV front axle, TV rear axle and TT axle) by the WD system (weight distribution hitch and the WD bars). WD...aka weight distribution...aka moving weight around from one place to another. Once you accept that there is a distribution of weight, then you'll understand comments that the both of the TV's axles must drop. If one of the TV's axles does not drop or show increased weight, the WD system is not working, mis-adjusted or something is wrong." So it seems both these quotes have it dead wrong by your definition - instead of 1/3 the 900 # weight, there will actually be a couple thousand. I don't want to mention the names behind these following quotes, but please read them: ----- So it seems both these quotes have it dead wrong by your definition - instead of 1/3 the 900 # weight, there will actually be a couple thousand. I do not like to comment on things taken out of context. I have read the complete text of the two posts from which the quotes come. I have no major disagreement with the gist of either post. Obviously, I would prefer to see reference to "distribution of hitch load" versus "distribution of tongue weight". The 1/3-1/3-1/3 distribution can only be achieved for selected combinations of TV/TT dimensions. However, it is relatively easy to produce an UP force equal to 1/3 of the "tongue weight" at the TT's axles. It is more difficult to get the TV's axle reactions to be equal. And, I do not think that is the primary objective of the WD hitch. The full WD bar load (2000# in my example) does not get "distributed" as you have implied. The 2000# load causes an UP force of 300# (in my example) at the TT's axles. This causes the TV's front axle load to INCREASE by 612# and the TV's rear axle load to DECREASE by 912#. Please note that I never have specified in my example what the "tongue weight" is. It does not enter into the distribution calculations. How did I know you were going to say that? OK you had me thinking that I had it all wrong to now thinking that I had it right. I always thought that a WD hitch distributed some of the weight on the TV receiver onto the TV's front axle and the TT's axles thereby resulting in less actual weight where it once was. The gist of the quotes you agree with imply that a 900# weight gets distributed roughly in thirds. You never stated that in your original explanation and that is what confused me.